I have been thinking how I could incorporate my Architecture studies into this blog. 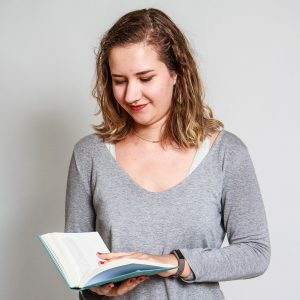 I have tried in the beginning to introduce you to the subjects I am taking this semester at the TU Delft, but I feel it is a bit boring to keep updating you on how my classes are going (they are going well by the way). Therefor I have been thinking on how to add a bit of Architecture to this blog, and this weekend gave the perfect opportunity! I went to visit the recently opened ‘Markthal’ in Rotterdam and I thought this might be a great way to try to write about Architecture. So here it goes. 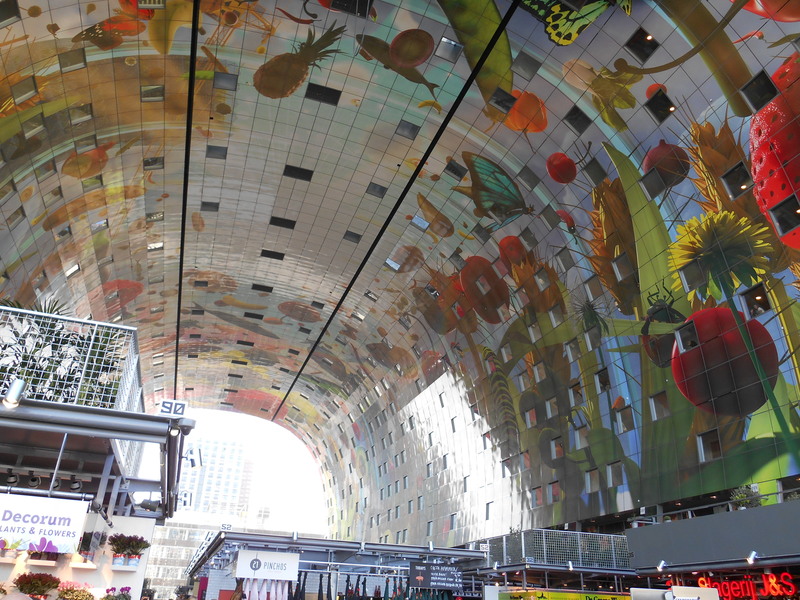 The Markthal is, as the name suggests, a market in a hall. It was designed by MVRDV. It is shaped like a horseshoe and on the inside is a gigantic artwork covering the inner arch. The people in Rotterdam have already given it a wide array of nicknames, ranging from the ‘Groentegrot’ to the ‘Puntenslijper’. The outer layer of the building houses apartments and on the inside is the market. In my opinion the outside is quite ugly. I think it is a pity that there is glass curtain wall covering the whole opening of the Markthal. Although it gives an interesting reflection, it hides the artwork during daytime. I also feel the facade on the ‘short’ side look really flat, with the natural stone cladding not really turning the corner but just appearing as a thin slab at the end of the building. However, the inside is absolutely stunning. Before the building was finished, a lot of people (including me) did not believe the art all over the ceiling and walls would work. I personally thought it might look childish, especially with the bright colors that were used. Not so much now it is finished though! The floor of the hall is filled with small shops with luxurious food-ware. It is quite weird to go into a market hall with stalls of expensive food, when the regular market is right outside.. I really wonder if the stalls will continue to sell enough to afford the expensive rent that they probably have to pay. The food however is obviously delicious, and there is a wide diversity of products. I especially like the little terraces that were created on top of some of the stalls, creating the opportunity to relax a bit from all the walking around and, while eating some food of that stall, take your time to look at the marvelous ceiling. There is also a balcony along the edges that is open to public, from which you can look down on the stalls and all the people walking around. 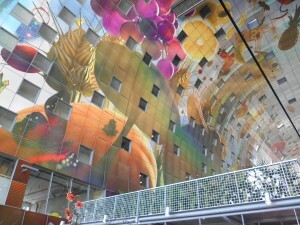 After visiting the Markthal, I liked it a lot more than I thought I would. It is a nice place to splurge on some nice food and enjoy the view of the ceiling. However I do wonder if the stalls are going to be able to keep selling their goods, with another market right in front of it 2 days a week. Although the inside is quite stunning, the outside still looks odd to me. 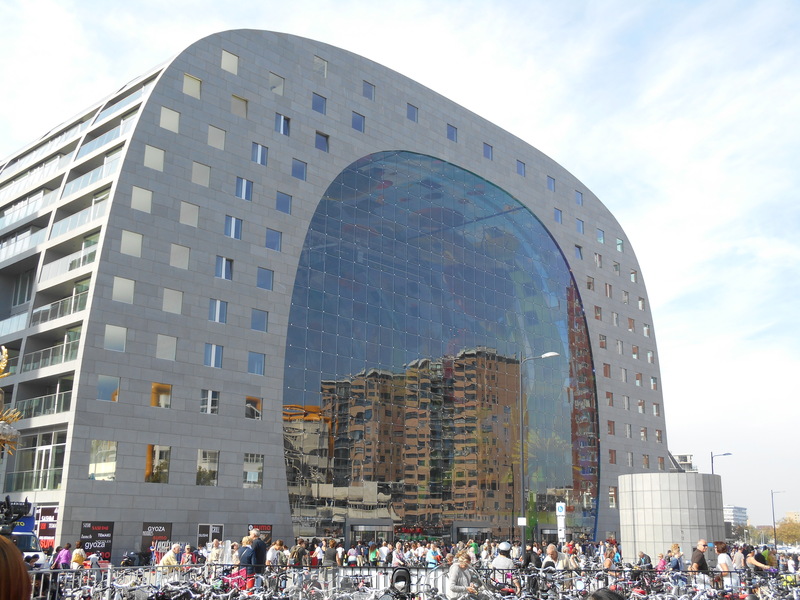 In the end though, it definitely suits Rotterdam in an architectural way, with its unusual exterior and stunning interior.